Veterans for Peace will be displaying more than 6,900 tombstones from dawn on May 26 through dusk on Memorial Day on 8th Avenue just east of 31st Street as part of their Memorial Day Weekend event to remember soldiers who have died in the wars in Afghanistan since 2001 and in Iraq since 2003. The tombstones will line the street along 8th Avenue just east of 31st Street, where the Solar System Walk is located. This is the eleventh year VFP has set up the display, and in 2008 they had to cross over to the north side of Eighth Avenue due to the continuing number of deaths in Iraq and Afghanistan. Earlier this year, Veterans for Peace announced the annual Peace Scholarship award, a college scholarship program for Alachua County students. The scholarship competition was open to eligible high school seniors, college students, and adults who need financial support to succeed in college and who have demonstrated a commitment and leadership in activities involving peace and social justice and/or nonviolent social change. Veterans for Peace members believe that peace-making and hope for a peaceful world begin in our community, our homes and our schools. That is why they invited students to participate in the contest this year; a peaceful possibility lies in the younger generations of today who will be leading, transforming and inspiring the world tomorrow. On Friday June 29, the Civic Media Center will reprise its successful art sale of the print works of Sara Amatniek, who died in 1996. She left behind hundreds of unique prints that cover a range of subject matter: plants, animals, fish, people, and abstract and geometric designs, with multiple copies of each design in varying colors and intensities. Many prints were sold during the first sale at April’s ArtWalk, but more remain priced to sell at at $3, $5 and $10 for small, medium and large prints. There are a couple dozen larger matted prints for $30. Every other month, the Florida Organic Growers discuss a book or documentary that has been selected to generate a conversation about how our contemporary food system can help us better understand the complex issues of race, class, gender, both our collective and individual histories, and how we might envision and achieve a more sustainable, socially-just society. The Food Justice Study Group will next meet May 31, from 6:30 to 7:30pm at the Civic Media Center located at 433 S. Main St. All are welcome. It’s certainly been an exciting 2018 for your community radio station. After starting the year by celebrating ten years of broadcasting, we’ve continued making strides on our studio in the back of the Civic Media Center. After a few beta tests, we had our first live broadcast from the space in early May, and look forward to more as we adjust our program schedule to handle more live and local programs. On March 28, Citizens Against Phosphate Mining filed a Notice of Violations of Federal Law with FDP, the Army Corp of Engineers, USEPA and seven other agencies or offices. This is a detailed and meticulously researched documentation of wells drilled in the wrong place and wetlands drained for the wrong reasons. Agencies have not stopped this unpermitted activity in some specific areas of Union and Bradford counties. Permits are required for well-drilling, and this step was simply skipped. Landowners can build roads and ditches through logging areas, but their idea seems to be eliminating wetlands prior to establishing a baseline for the planned mine. That way, the regulations, especially for reclamation, will be less stringent than if it were a wetland area. 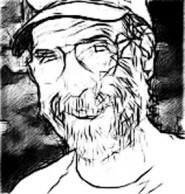 Gary Gordon, known by many in Gainesville as an original member of the Archer Road Band, an organizer with the anti-nuke Catfish Alliance, a City Commissioner and Mayor-Commission (1983-86), a playwright and comedy radio show producer who left our city in 1991, has moved back and will be doing a concert of his original songs at the Thomas Center on Saturday, June 16. While in L.A., Gordon worked as a writer and musician and continued his activism. On periodic visits to Gainesville, he would often play benefits for the Iguana or Civic Media Center. Yay Gainesville! Gigi Simmons was able to prevail in the run-off against Charles Goston on May 1. Her and Gail Johnson’s swearing in on May 17, at the Thelma Bolton Center, will be a powerful and happy event. More on that in the July/August Iguana. Florida Organic Growers’ new local business incubator, 435 South Main, located between the Civic Media Center and Tamal, is now open for independent entrepreneurship, classes and private events. The location serves as a community platform for independent entrepreneurs and educators to operate in a low-cost environment by offering access to a certified commissary kitchen and pop-up cafe space, as well as a retail and classroom area. 435 South Main is operated by volunteers and is currently open to the public during the Artwalk on the last Friday of each month, and summer operating hours are every Thursday and Friday. Hours of operation will expand as new entrepreneurs and volunteers come on board. To participate, contact Casey (904-716-0526) for kitchen and café-related inquires or Sarah (352-562-5138) for retail, event and class inquires. Visit the Facebook page 435 South Main for events and opportunities. The Alachua County Labor Coalition (ACLC) has worked with the UF Faculty Senate, United Faculty of Florida Chapter at UF, Graduate Assistants United, UF Student Government, and members of the community to demand support, dignity of work and equitable working conditions for UF’s OPS workers. OPS are UF’s so-called “temporary” staff, even though many of them have labored at UF for years. These workers lack any job security and receive no benefits: no sick leave, not even contributions to their Social Security accounts. In writing this I am well aware of the variety of people who will be reading it. We print 4,500 copies, and they are mailed to about 350 subscribers (thank you for the support! ), and the rest can be picked up in all kinds of places: restaurants, coffee-shops, bars, boxes on campus and in the community, the Downtown Farmer’s Market (you can say hi there), hotels, libraries. When I was in college last century (1969-73 to be more precise), I remember finding Ramparts magazine in the library. It was newsprint, not like Time, Life, and other glossy magazines I was used to. And it had coverage I did not see elsewhere. But that coverage rang truer to me than what I saw elsewhere about the Viet Nam War, a primary concern at that time for me, and other social issues as well. 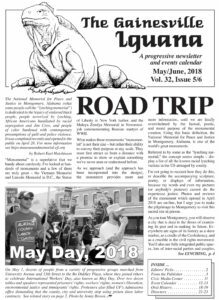 Activists in Gainesville have been celebrating May Day as an international workers’ holiday for much of the last 20 years with marches and rallies downtown highlighting various labor struggles and social movements. City officials even formalized the date on their calendar in 2017 by officially declaring May first as Immigrants’ Rights Day. This year, grassroots organizers from local prisoners rights and prison abolition organizations highlighted the issue of prison slavery in our community. Gainesville’s Parks, Rec and Cultural Affairs, for example, gives the Florida Department of Corrections (FDOC) over $172,000 for the slave labor. The County and University of Florida also use prison slave labor as a way to cut costs and undermine living wage ordinances. Other state agencies active in the area also use prison slaves, including the Department of Transportation, which allocated over $19 million dollars to prison slave labor statewide last year. The City’s decision to declare support for immigrant workers in our community last May Day was bold and a powerful statement of solidarity. This same solidarity was also extend to other vulnerable workers among us. With this in mind, organizers with the Incarcerated Workers Organizing Committee (IWOC, which is part of the IWW union) and the Campaign to Fight Toxic Prisons (FTP) decide to kick off the May Day march with a spontaneous slight detour to Tigert Hall on campus, which houses the UF Office of Admissions. Armed with drums, banners, bullhorns and stacks of leaflets, IWOC and FTP members marched through the doors and up all three stories of the building calling on the administration to sever its ties to racists slave contracts it has with FDOC. Last year, The Fine Print reported that UF’s Institute of Food and Agricultural Sciences (IFAS) used prison slaves in at least six farm sites it maintains for research purposes, including locations in Alachua’s neighboring counties, near Live Oak and Citra. Over 130 years after the first May Day, and 150 years after emancipation, the U.S. still retains millions of slaves, sanctioned by the 13th Amendment of the U.S. Constitution, justified as punishment for criminal convictions. While mass incarceration has turned slavery in to a multi-racial affair, the racist implications are impossible to ignore. Black people make up about 16 percent of Florida’s population, but 32 percent of the state prisoners. “Monumental” is a superlative that we bandy about carelessly. I’ve looked at hundreds of monuments and a few of them are truly great – the Vietnam Memorial and Lincoln Memorial in D.C., the Statue of Liberty in New York harbor, and the Malaya Zemlya Memorial in Novorossiysk commemorating Russian martyrs of WWII. 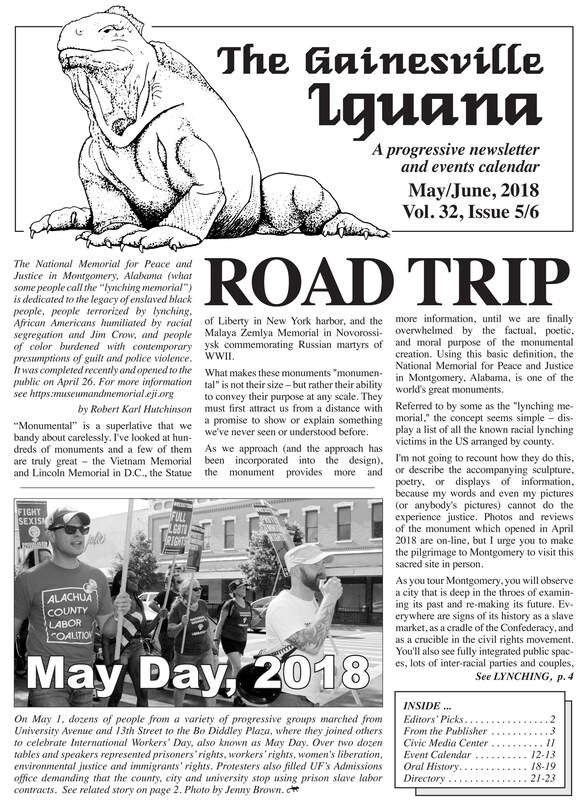 The May-June 2018 issue of the Iguana is now available and you can access it here! If you want to get your hands on a hard copy, check out our distro locations here.